"Stimming" is a repetitive physical action that provides enjoyment, comfort and contributes towards self-regulation of emotions. 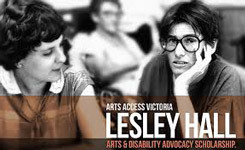 This project has been supported by Arts Access Victoria through The Lesley Hall Scholarship Fund. The project also acknowledges the support of its disability services and mental health stakeholders, Annecto and Deakin University.